Citation: C N Trueman "James Nicolson"
Eric James Nicolson was the only member ofFighter Command to win a Victoria Cross during the Battle of Britain. In fact, Nicolson was the only member of Fighter Command to win a VC throughout the whole of World War Two. His VC can be seen at the RAF Museum in Hendon while the badly burned uniform and ‘Mae West’ he wore as his Hawker Hurricane burned can be seen atTangmere Museum, near Chichester, along with parts of his Hurricane that crashed near Romsey, Hampshire. Nicolson was born on April 29th 1917. After an education at Tonbridge School, he started work as an engineer at Ricardo Works in Shoreham, West Sussex, before joining the Royal Air Force in 1936. Nicolson was commissioned on December 21st 1936. Following on from his training, Nicolson joined 72 Squadron in 1937 before moving to 249 Squadron in 1940. On August 16th 1940, Nicolson, along with other members of 249 Squadron were on patrol above Southampton – a key target for Luftwaffe bombers as a major Spitfire factory was based there. Flying from Boscombe Down, Wiltshire, they had been alerted to the fact that there was an incoming attack. Nicolson engaged a Me 110 but he was unaware that Me 109 fighters were flying above the 110’s. One of the 109’s attacked and hit Nicolson’s Hurricane with four cannon shells. Nicolson was temporarily blinded by blood flowing down his face after his cockpit window shattered and splintered. Nicolson was also injured in the foot. The reserve fuel tank on his Hurricane caught fire and Nicolson started to get badly burned. As he prepared to bale out, Nicolson saw another Messerchmitt and climbed back into his badly damaged cockpit, targeted the Messerschmitt and fired at it until it was on fire. Only after doing this did Nicolson bale out. However, during his descent, members of the Home Guard, under orders, fired at him. They only stopped firing when they were convinced that he was a member of the RAF. Another of Nicolson’s colleague – also involved in the dogfight – was not so lucky. 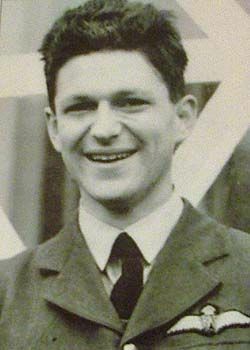 Pilot Officer Martyn King had also been forced to bale out of his Hurricane. King’s parachute candled as a result of the gunfire it sustained and he fell to his death. It took Nicolson some months to recover from his injuries, especially the burns he suffered from. He was in an RAF hospital at Halton until February 23rd 1941 before convalesing at a RAF facility in Torquay, Devon. However, by September 1941, he was flying again and was appointed commanding officer of 1459 Flight RAF. In March 1942 Nicolson became a staff officer at HQ 293 Wing RAF, Alipore, India. In December 1942, he moved to the Air HQ at Bengal. By 1944, Nicolson was a Squadron Leader flying Bristol Beaufighter’s for 27 Squadron in support of ground forces fighting in Burma. For this work Nicolson was awarded a Distinguished Flying Cross (DFC). By mid-1945, Nicolson was a Wing Commander based at the 3rd Tactical Air Force HQ in Comilla, Bengal. On May 2nd, he flew as an observer on a raid on Rangoon. Nicolson was killed when one of the engines on a B-24 caught fire two hours into the flight. The aircraft was ditched into the Bay of Bengal with only two survivors out of a crew of eleven. His body was never recovered.